At the young age of ten-years old, Jimmy Hull knew he had a passion for being on the water. By the time he was 14, Jimmy’s dad bought him his first small boat- providing him with a way to explore the waterways of both the Halifax River all the way to Ponce Inlet. 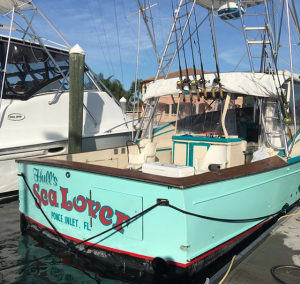 After many trips to the inlet, Jimmy took his captain’s license exam and passed, and at the age of 20, Captain Hull began running his first charter and commercial fishing boat. Captain Hull would spend days out on the sea and then come unload his fresh catch at the docks of Ponce Inlet to sell to local fish markets. In 1984 Captain Hull stumbled upon the opportunity to open his own retail seafood market. As the business began to grow, Captain Hull expanded his retail space. In 2005, Captain Hull opened a small seafood kitchen, which was strictly for take-out orders only. While there was no fancy atmosphere or water view, the focus remained on serving the freshest seafood available. Due to its popularity, Captain Hull expanded the restaurant to include both indoor and outdoor seating as well. Today, Hull’s Seafood Market and Restaurant continues to supply locals and visitors alike, as well as many local restaurants, with the freshest seafood available. Captain Hull still stays true to his passion, running his own blue crab and fishing vessels. His desire to serve fresh, local seafood remains both in the market and restaurant. Thanks to locals and visitors alike, we have been able to support countless local fishermen in our community and throughout Florida. We hope you enjoy our seafood as much as we have enjoyed serving you for 30 years.